Kansas City Roofing and Sheetmetal is dedicated to providing a great experience for you during the construction process while allowing you to keep your business open and running. We make it our priority to protect your employees and customers while we work, and we do our best to maintain a clean job site that reflects well on your business. With continuous training in all the latest products and applications, our team is ready to handle your commercial project, no matter how demanding it may be. Let one of our commercial staff members assist you in choosing the right roof for the job. Built-Up Roofing is one of the oldest and most reliable methods of roofing. It was first known as composition roofing and started in the 1840′s. Built Up roofs are exactly that, they consist of several (as many as 6) plies of roof felt laminated in hot asphalt, Built-Up Roofing is one of the oldest and most reliable methods of roofing. It was first known as composition roofing and started in the 1840′s. Built Up roofs are exactly that, they consist of several (as many as 6) plies of roof felt laminated in hot asphalt, and surfaced with gravel set in a flood coat of asphalt. The multiple plies create terrific protection against leaks. The flood coat and gravel surfacing provide impact resistance and UV protection. Extreme resistance to wind uplift. Modified bitumen roof systems have expanded their share of the commercial roofing market in recent years. 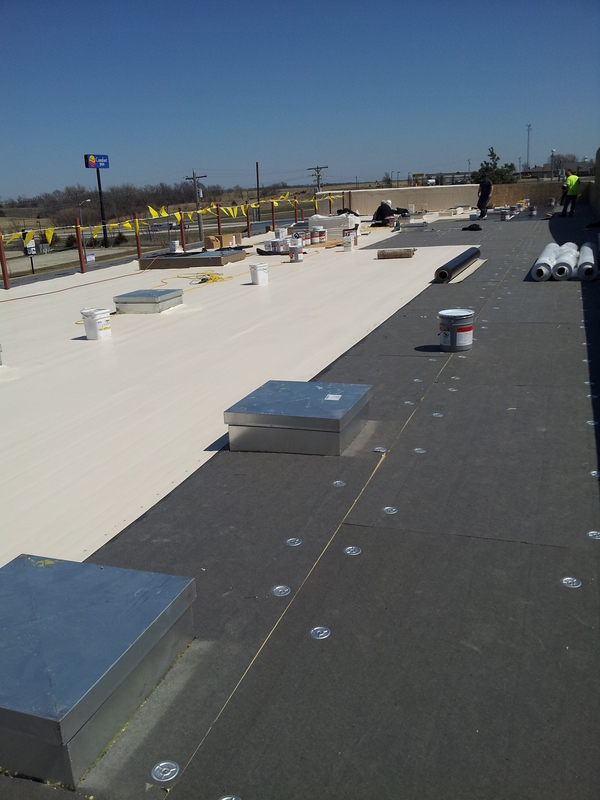 Atactic Poly Propylene (APP) and Styrene Butadiene Styrene (SBS) modified bitumen membranes comprise about 60 percent of the commercial roofing market. The growth of modified bitumen roof systems is likely due to many factors including: Familiarity in the marketplace – modified bitumens were introduced in the U.S. in 1972, are user friendly which allows contractors to use their built-up roofing equipment and expertise. Single Ply Roofs all fit into the category of elastomeric roofs. Elastomeric materials are those that will return to an original size after repeated stretching. Some elastomeric roof materials will stretch to as much as 450% their original size without damage. This is a vulcanized rubber product that is manufactured in sheets up to 50 feet wide. It is available in black and white only. EPDM can be loose laid, mechanically attached, or fully adhered. Membranes are available with and without reinforcement scrim, and are made in thicknesses up to 60 mils (.060″). TPO membranes are single-ply roof membranes constructed from ethylene propylene rubber. They are designed to combine the durability of rubber with the proven performance of hot-air weldable seams. They have been tested as having excellent resistance to ozone, are algae-resistant, environmentally friendly and safe to install. The material’s manufacturers are so confident in properly welded seams that the material is sometimes advertised as a monolithic (seamless) roof. Seam strengths are reportedly 3 to 4 times those of EPDM’s adhesive and tape seams. TPO is highly resistant to tears, impacts, and punctures with good flexibility to allow for building movement. TPO’s are available in white, light gray, and black with thicknesses of either 45 mils (.045″) or 60 mils (.060″). The width of the membrane depends on the manufacturer but they usually come in widths of six to six-and-a-half feet and are one-hundred feet in length. PVC membrane is a roof membrane composed of only one layer of material – polyvinyl chloride. PVC roofs are specially designed to withstand ponding water- PVC membrane is welded together with hot air (no open flame) to eliminate all seams so moisture can not pass through. PVC roofing systems also reflect nearly 90% of the sun’s heat, thus lowering energy costs substantially, especially in high-heat areas such as the southwestern United States. PVC’s are available in 50 mils (.050″), 60 mils (.060″), and 80 mils, and in sheet widths up to 78″. Leak Repairs……100 percent guaranteed for one full year! Reliability is the hallmark of metal roof materials with manufacturer warranties ranging from 20 to 50 years when the installation is performed by a professional metal roofing contractor. There are basically two types of metal roofs: Those with exposed screws or fasteners and those with unexposed fasteners. Metal roofing with interlocking seams that cover the screws (unexposed fasteners) are known as standing seam while the type with exposed screws on the outside are referred to as roof panels. The styles of roofing design are often referred to as rib panels, V, U, 5 V crimp, M seam and specialty designs such as shake, metal shingle and metal tile. Roofing materials constructed from tin, galvanized steel, stainless steel, copper, lead, zinc, aluminum and alloy combinations are commonly available. There is an endless choice of roof colors and style options from flat panels to corrugated making metal a great choice for both commercial roofing as well as residential house roofs. Standing Seam: A standing seam is a vertical metal panel that lies flat and is joined together at the sides by concealed fasteners. An interlocking joint forms a seam at the connecting points between panels making the seams a water tight barrier from rain and water spray. Standing seam roofs are usually seen on commercial roofs such as government buildings, restaurants, service stations, banks and industrial buildings. Many businesses have gone to standing seam roofs with identifying colors to be used as a brand. Aluminum Roofing: Aluminum provides superior protection in areas that are exposed to the damaging effects of salt spray and higher wind. Aluminum roofs are available in either interlocking panels or the popular interlocking shingle and tile design. Aluminum is also a great energy efficient choice in residential roofing systems, while offering an wide array of beautiful colors and styles. It is not uncommon for home owners to see a drop in their home heating and cooling bills of up to 20% in cost. Corrugated Metal: Corrugated metals are a lighter weight metal roofing choice, usually in 24 – 26 gauge thicknesses, making it an ideal lower cost solution for home and commercial applications. Corrugated metal roofs are normally made of steel in the form of V, U, and 5 V crimp style of roof panels. Factory applied acrylic coatings such as Galvalume® offer greater protection against rust and corrosion on steel roofing. The panels are secured by connecting the overlapping sheets with color coordinated screws. The roofing contractor responsible for installation should also take the time to caulk all connecting screws and seams, thus providing further protection against damaging roof leaks. Metal Shingles, Metal Tile and Shake: Similar only in appearance with asphalt shingle, clay tile and cedar shakes, specialty designs in metal roofing such as stone coated metal shingles have become a popular choice for residential roofs, restaurants, church roofing, townhomes and condominiums. Metal shingles, tiles and shakes add visual design appeal with none of the disadvantages of traditional roofing products due superior environmental protection, long life and extended manufacturer warranties. More than just roofs, commercial and industrial applications in aluminum siding is a popular selection for business owners due to low maintenance and extreme weather resistance. Residential uses are often for storage buildings and barns. Many designs are readily available, from wood simulations to the most frequently seen industrial appearance. Factory applied finishes offer consumers an enormous color selection while boasting high corrosion protection. The price of metal roofing averages approximately 20-50% higher than the cost of a traditional asphalt shingle roof depending upon which type of roof material is chosen. Roof panels commonly referred to as “residential roofing” are often constructed from a thinner gauge, while “commercial roofing” is normally selected from standing seam designs. Standing seam is the higher priced choice. Roof coatings can also be applied to extend the life and create a water proof barrier at very reasonable prices. Coatings cost a fraction of what a roof replacement would average and can add many serviceable years to a business or home roof. Kansas City Roofing and Sheetmetal has been repairing and installing steel, tin, aluminum roofs, metal roofing and metal siding in the Kansas City area for many years. If you are interested in knowing more we would be delighted to explain the advantages and disadvantages in the different types and styles available to you.